Persian Grass Blue, Голубянка гальба. The species is distributed in Asia Minor, Levant, Transcaucasia, Iran to Northern India, and deserts of Central Asia. The presence of the species in Armenia is under question, but the Transcaucasia is inhabited by nominate subspecies. In Transcaucasia the Persian Grass Blue inhabits lowlands in vicinity of ponds and irrigated lands, semi-deserts, and roadsides, occupying elevation range from 0 to 800 m a.s.l. The only mention of the species in Armenia (Didmanidze 2004) is related to Ararat Plain, and although the area is quite similar to the habitats of the species in Azerbaijan, however the host plant of the species - Lagonychium farctum, is not yet found in Armenia. It appears that the host plant plays crucial role in the life of the species as females lay their eggs at the buds, while the caterpillars are feeding on the flowers and seeds. The species gives several generation, flying from May to October, so in case it occurs in Armenia, it should be relatively easy to determine the butterflies. Presence of Persian Grass Blue in Armenia was mentioned in the literature (Didmanidze 2004), however after the species has not been recorded in the country. Therefore there is no data about its current presence in the country. Ararat Plain is the highly urbanized region where most of the habitats have been transformed. Therefore it is possible that the species became extincts from Armenia due to habitat destruction. The species is not included in the Global, European, and National Red Lists, as well as is not included in the CITES and Bern Conventions. 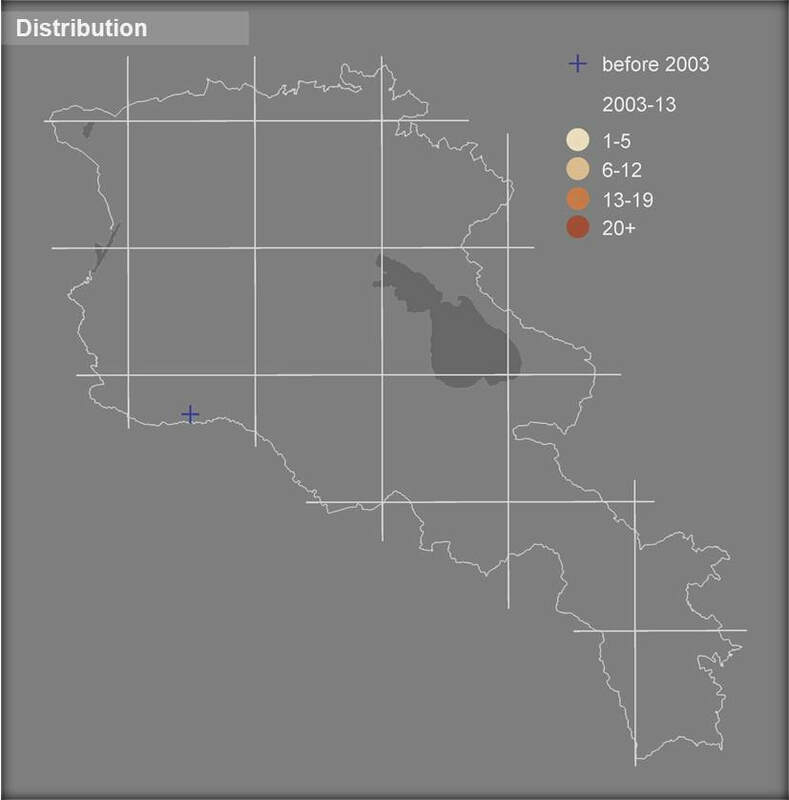 Taking into account the scarce records of the species in Armenia, its conservation status corresponds to Data Deficient. The area where the species was historically recorded has no protection status. Therefore the most important conservation measure is determination of the presence of the species in Armenia, and in case it still exists in the republic - to develop urgent conservation measures, along with identification of its distribution range, abundance, and other biological and ecological traits.